In the news today, Israeli President Shimon Peres is calling on Israelis “to save the majority from the hands of a small minority”. Ultra-Orthodox Jews (who are exempt from military service and, rather than working, collect a government subsidy for religious studies) are increasingly resisting the secular nature of the Jewish state and trying to enforce ancient religious practices. "Segregate women", the sign says. But surely the men are free to segregate themselves? At home? And veil themselves when they go out? 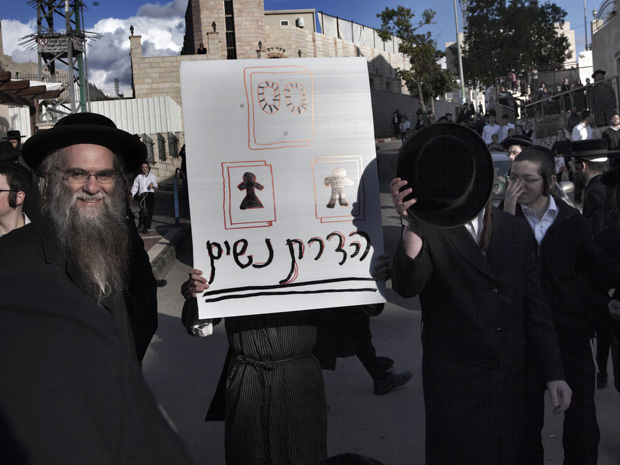 The Ultra-Orthodox demand strict gender segregation and “modest” dress for women. Recent incidents have seen schoolgirls harassed and spat at, and women ordered to sit at the back of local buses or get off, despite court rulings that women can sit anywhere on a bus. This issue resonates interestingly with the position of Muslim hardliners in other countries, and with the Jewish resistance to Roman rule 2,000 years ago. When Rome ruled Palestine, the same dynamics were in play. Rome wanted a live-and-let-live religious environment where anyone could worship any god, and temples to all of them were scattered about. The more secular of the Jews were happy with this – they enjoyed the peace and improved travel and trade that the Empire brought. But the more religious of the Jews wanted to cleanse Israel of the beardless, pig-eating, polytheist idolators, and they wanted all Jews to repent and return to the Law of Moses. To them, all Jews were one family and everyone else should be evicted from the Promised Land. Jesus was only one of a stream of would-be Messiahs who, over a 200 year period, led uprising after failed uprising against the Westerners and got crucified for their pains. Osama Bin Laden was of that mindset and he too has been executed. Secularism is gradually replacing religion around the world in a several-generations process now speeded by mass media, mass travel and the Internet. But the Ultra-Orthodox may well have a decade or two of success ahead of them. The same things are still happening, that have been going on for 2,000 years. The Westernization of Israel is still in question. This entry was posted in Politics, Religion, Society and tagged Israel, Jesus, Jews, monotheism, Osama, polytheism, Romans, secularism, Shema, ultra-Orthodox, uprising.